To ring in the New Year, I traveled to the beautiful tropical islands of Maui, Hawaii and explored its’ beauty for over 9 days. This island living reminded me to start the New Year with the biggest goals in mind and to do it in all the right ways. I experienced the historical background of the island, the kind people who live simply and happily and soaked in every ounce of that January sun. I knew Maui was going to be a treat; upon arriving and then driving to our resort to spot over 5 whales casually breaching as we drove along the winding roads, had me in awe. Garrett, my boyfriend, and I kept yelling at each other, “Babe look! There’s another one!” as the bright red rental car would slightly swerve to catch the last splash of the magnificent whale tale. This was only the beginning of wild life showing us how they roll, so if you’re into whale watching, snorkeling with wild and friendly sea turtles, or lots and LOTS of wild chickens. This is your vacation. The hawaiian islands are what I consider to be one of the most pure forms of nature in the U.S. The locals are aware that the choices we make directly affect their wildlife and land, so they choose to be conscious of how and what they do. They enjoy the vast waterfalls, volcanos and beach living while maintaining them, leaving it as they came. I deeply respected the way they are with their land and how they all do their part, keeping the island as clean as possible. At one point, we stopped off to visit the infamous Twin Falls on the Road to Hana. Garrett noticed a can sitting abandoned and picked it up to throw it away; this was the start of our trip before knowing how the locals feel about littering, and before we knew it, a random stranger came up to him and said “Is that yours?” Garrett reluctantly said “No, I was just going to put it in the trash” The stranger lit up with the biggest smile I’ve seen, stuck out his hang loose sign and said “I appreciate that bro, mahalo.” That moment struck me, and if there is anything you can take away from here, I hope it is to realize that you do make a difference. Do your part to keep this world beautiful for us, nature, wildlife and our kids. I can comfortably admit I am not the typical tourist. I don’t enjoy sitting at a resort drinking pina coladas and sun bathing for a week, one day is good enough. The rest of the time, I want to adventure the island and see what the culture has to offer. What can I learn, and what things can I see? The Road to Hana was easily the top rated tourist attraction in Maui. Every local, concierge and friend who has visited explained this was the must-do on the island. While I did enjoy the Road to Hana, and I do recommend doing the entire drive from Paia to the Black Sand Beach at Waianaepanapa State Park, it is a very long drive and you will be spending most of your day in the car. The best way to do the Road to Hana is splitting it into two days. First, the waterfall half, and second, the scenic drive to the black sand beach on the east side of the island. The best part of the Road to Hana is the strip of waterfalls at the very beginning, starting with Twin Falls. It is a small, one-lane winding road that takes you through pure green jungle with vines coming over the top of you, and behind almost every bridge leads to a towering waterfall. Although they are not ALL accessible, the best ones are, and you will not be disappointed. We spent a day in hiking boots/water shoes and bathing suits jumping off of the jagged rocks into four different refreshing ponds. The waterfalls pour thousands of gallons of water into each personal swimming pool effortlessly, easily making it a local hot spot for teenagers to spend their day. I recommend starting at Twin Falls, the most popular waterfalls (and definitely not the best) and working your way east until you’re all waterfall-ed out. We were able to hit four different waterfalls and comfortably spend time to enjoy each of them before heading back to our resort on the west side of the island by dinner. This was my favorite part of the trip because of the hiking involved, adventure encouraged and jumping off of mini cliffs made it exhilarating! If you’re not in for the adrenaline, there are plenty of side trails to explore each waterfall. Just remember, when chasing waterfalls the higher you climb, the BIGGER the waterfall. After a day of exploring, you definitely need a day of recouping. We did this at the best and first winery in Maui established in 1974, Maui Wine. This winery is in the heart of Maui, and the drive itself makes you understand the reason why people just can’t resist living here. The road is maximum 20mph, winding through mountainous greens and occasional livestock. It teeters on the edge, overlooking the never-ending pacific ocean and while you’re absorbing in all of the beauty, the sign to pull off has arrived. The best part of Maui Wine is their appointment only, Old Jail Wine Tasting. You are escorted from the main tasting room along a small concrete walkway, to be welcomed by a small, old brick building that once served as captain James MaKee’s private office. We enjoyed our intimate tasting with Ali who was easily the most informative and friendly sommelier and ended it back at the the tasting room for some small bites, and more wine. 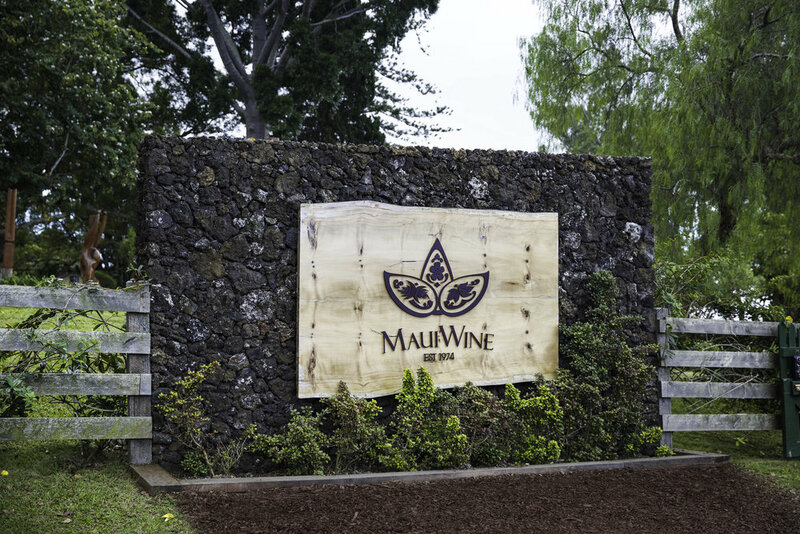 Maui winery has an impeccable experience, whether it be a casual walk in to try out one of their delightful wines or to play a game or two of corn hole they have set up outside for visitors. The staff here takes great care of the large amount of site-seekers, and by noon the tasting room booms with new and old wine oenophilia, making it 4 million visitors from around the world in total since their opening in 1974. I highly recommend trying their award winning rose when visiting because of it’s unique and wonderful in flavor. It is truly one-of-a-kind, just like the winery and experience itself. Don’t forget, if you happen to do the Old Jail Wine Tasting, ask to see the secret trap door leading underground where there is a tunnel and another hidden room! 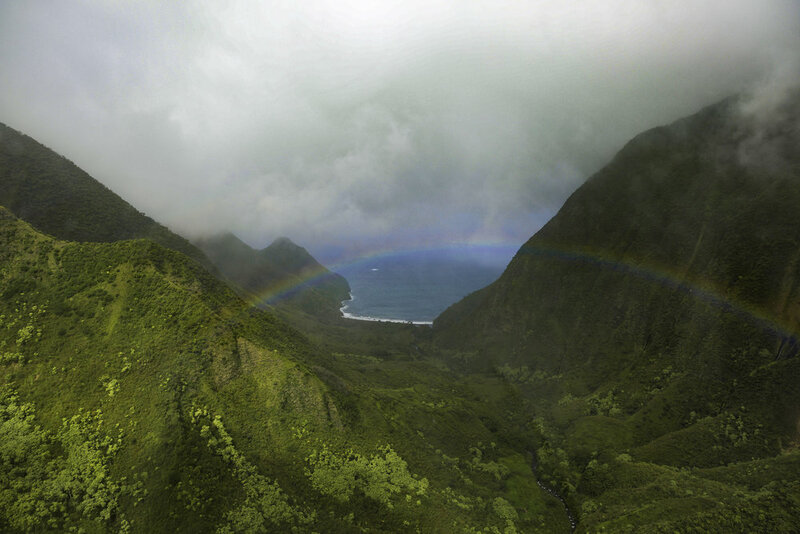 There is no better way to see the Hawaiin Islands than to see them from a birds eye view, climbing over 10,000 feet above sea level to experience waterfalls, private islands and coral reefs. 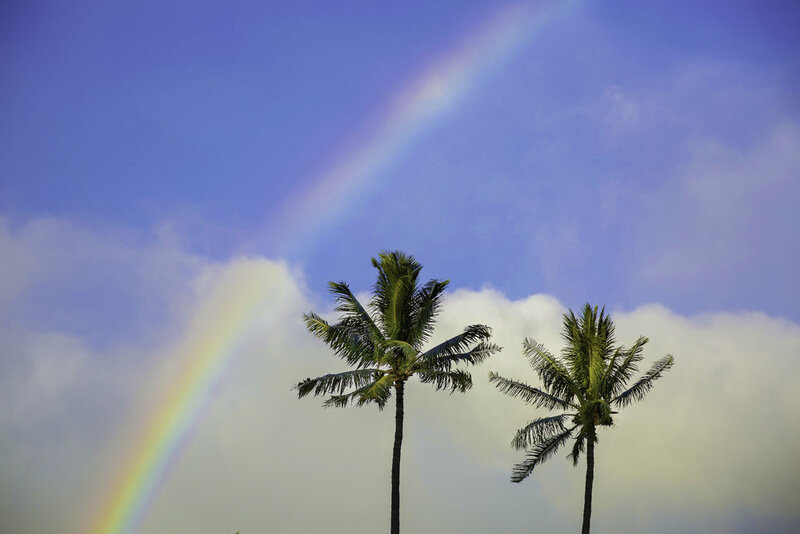 We toured from Maui through Molokai Village in sunshine and rain, experiencing a full radial rainbow and waterfalls nobody has even stepped foot near. The tour begins at the airport where you are seated indoors 30 minutes prior to departure to check in, get your weight for the balance of the helicopter and prepare for a trip of a lifetime. After safety precautions, we were seated with double belts (thank you) strapped in tight with a 180 degree view all around. 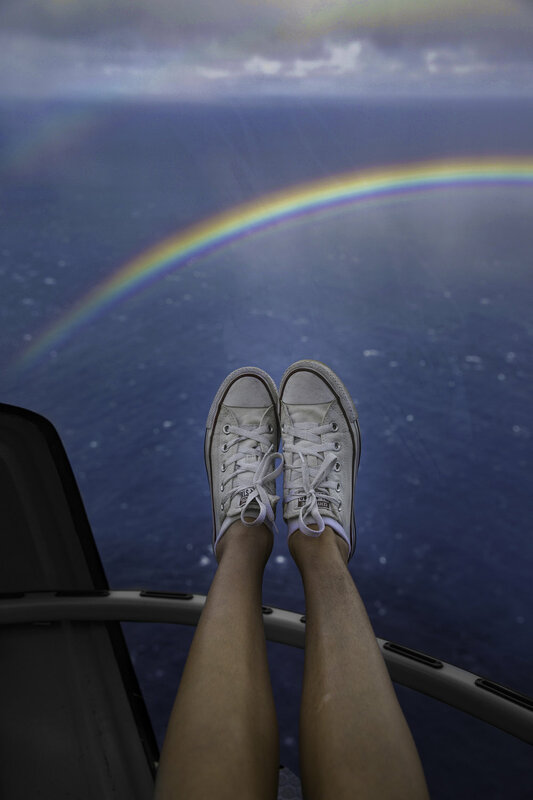 The captain turns on tropical “Moana” music as you soar above the towering volcanos and ocean right below your feet. Along our journey, we had some rainstorms pass through that painted a perfect picture of cascading green valleys with brightly lit rainbows leading you back to the ocean. We were “Oooing” and “ahhhhing” the entire time as the captain gave historical backgrounds of each island, waterfall and coral reef we passed over. If there is anything I would do again when I come back to Maui, it will be trying every single tour they have because of how enjoyable and fun it was to see parts of the island you physically can’t drive or walk to. I could tell you a thousand reasons why Maverick Helicopters is in the Top 5 Places in Maui to Visit, but I’ll just let the photos do the speaking. If you’re like me, sea turtles are what you’ve seen on Finding Nemo, not in life. I think about them saying “Duuuuuude” when I see the sea turtles, but when you’re underwater snorkeling and they come right underneath you, you are the one saying “duuuude”. The coolest adventure in Maui is that you can pop off into almost any beach and snorkel, yeah I know. There are so many live coral reefs and sea life that the sea turtles pop up everywhere! Sea turtles are almost as popular as the chickens here, making appearances everywhere. You’ll find the gigantic sea shells swimming just below the surface of the crystal clear water, and they aren’t afraid to come say hello. You’ll also spot them at sunset relaxing on the beach with locals; when I first saw a sea turtle (about 3 feet long) lounging on the beach with his eyes closed, I thought he was a rock, and then when I realized he was a turtle, I thought he was dead. But between those .5 seconds of my confusion, he cracked his eyes open, looking right at me! I was blown away that they couldn’t give a damn whether you are there or not. Disclaimer, it was highly advised by locals to steer away from them as much as possible. These animals ARE friendly, but they don’t appreciate being “pet” or flash photos in their face as they sun bathe. 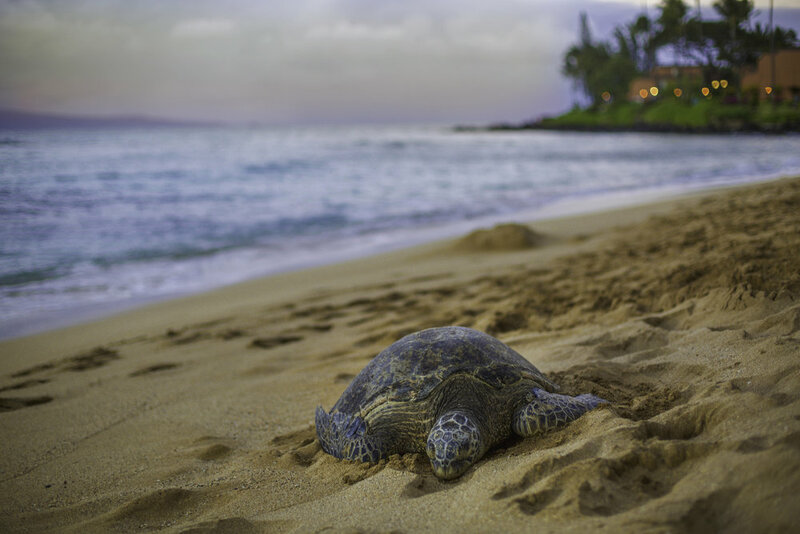 The best way to keep the exciting sea turtles and other wild life around is to let them be! If there is a day you want to sun bathe and adventure, pack snorkeling gear in your suitcase (rentals can be expensive) and take a dip to see the beauty below the surface. Whaler’s Village is on the west side of the island with over 90 unique shopping boutiques and restaurants, along with a colorful array of fun activities like hula lessons, lei making, live music, and not to mention it is right on the beach. This village is great for Luau sitings, beach days in luxury cabanas and a large strip of retailers with rental equipment like kayaks and boogie boards ready to be claimed for a day in the ocean. It's a hotspot for resorts and makes an exciting day for everyone. We spent our first three nights here, dining at the live music guru, Monkey Pod, and delicious hawaiin dining, Hula Grill. Every night we found ourselves watching a new live hula show or Luau, and on New Years Eve we took sparklers down to the beach and had a wonderful time watching fireworks light up the night sky, fire poi dancers and families having a trip of a lifetime. This is a great spot if you want to spend a day looking for souvenirs, time with the kids, or a romantic evening on the beach watching the sunset. Right next to Whaler’s Village is also another highlight, Black Rock. It is one of the safest spots to “cliff” jump into a deep ocean spot, right off of the beach. It’s pretty easy to access, but it does require moderate rock climbing to get back up! Most of my family managed to have this experience next to Whaler’s, making it easily one of the most stopped-at areas in Maui. I recommend booking your resort here as you will be accommodated and will avoid driving to different parts of the island when unnecessary! Overall, Maui has SO many other activities and endeavors you can experience, but these are by far my favorite. This tropical island is truly a gem, and we can’t wait to be back for round two. The locals are the part I will miss most, hearing so commonly, “Mahalo” meaning Thank You. So here is to the wild chickens, friendly sea turtles, exquisite wine tasting, towering waterfalls and soaring helicopters taking me to a place I’ve never been. Until next time, Hawaii.